We are having a Squashapalooza for this weeks Sunday Supper, and it is being hosted by the wonderful Alice of A Mama, Baby & Shar-pei in the Kitchen, and Christy of Confessions of a Culinary Diva. About a week ago, a friend of mine gave me 2 HUGE zucchini from her garden. I mean these bad boys gargantuan!! After I got them home they sat on my kitchen counter for a couple of days while I tried to figure out what to do with them. I had already made Turkey Sausage Zucchini Boats with over-sized zucchini from my own garden a few years back, but realized I didn't have much else that showcased zucchini as the main star. So wanted to come up with something fun. Hmmmmmm, think think think. What do you do when life gives you ginormous zucchini? Why you make ginormous zucchini cups, that's what you do! I was originally going to use quinoa in the recipe to make it a bit healthier, buuuuuttttt again my culinary expertise came in to play. I started the quinoa in a small pot while I was browning my sausage. When it came to a boil I quickly turned the heat down to low and went back to my sausage duty. All of a sudden I realized there was smoke coming from the pot and BAM I hear the smoke alarm go off. FIRE....FIRE.....FIRE (yes my smoke alarm is possibly the most annoying smoke alarm on the planet!). I , in my infinite wisdom, had turn the nob to the opposite eye to low, and left the one the quinoa was cooking on on full blast. Hence the rice in the stuffing. Now I have a stainless steel pot with black gunk in the bottom that I can't seem to get rid of. A reminder to pay closer attention to details I guess!! Cut the ends off of the zucchini and then cut them into 3 inch sections. Using a spoon (or melon baller if you have it), scoop out the center of the zucchini making sure to leave at least 1/4 of an inch thickness on the bottom. Salt and pepper the inside of the zucchini cups and set aside. Place the rice in a medium sauce pan and add 1 3/4 cup water (or stock) to the pan. Heat over high heat until boiling, then cover and reduce to low heat. Cook for 17 to 20 minutes, or until the liquid has cooked out. Meanwhile in a large skillet, brown the sausage using a wooden spoon to break it up into small bits. Cook until there is no pink remaining. Add the onion and garlic and cook until tender, about 5 minutes. Stir in the tomatoes with the juice, oregano, basil, paprika, crushed red pepper flakes, salt, and pepper. Continue to cook for another 2 to 3 minutes. Add the rice and combine well. Adjust seasoning to taste. 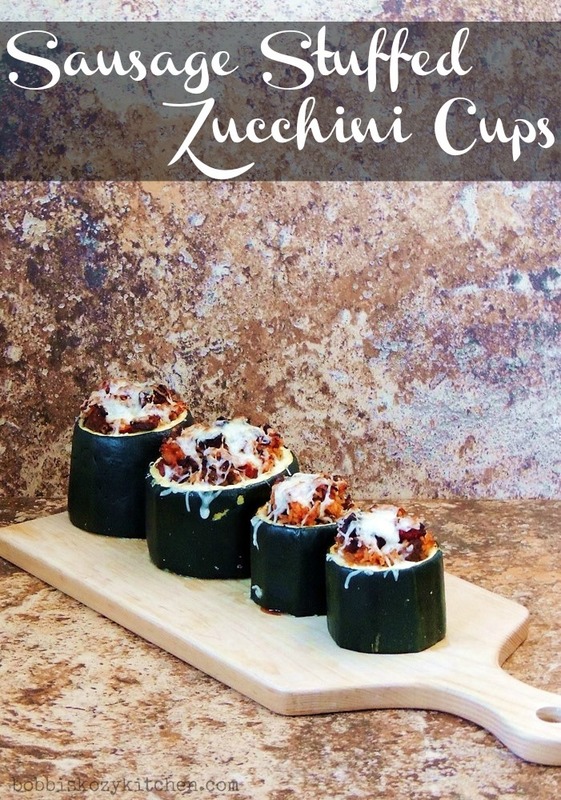 Carefully scoop the filling into each zucchini cup and then place the stuffed cup in a large casserole dish, or on a rimmed baking sheet. Bake for 30 minutes. Remove from the oven and add a shredded mozzarella cheese on top of each cup. Cook for an additional 5 minutes, or until the cheese has melted. Oooh, yum, sausage!!! Maybe this is the way to finally convert the hubby to a zucchini fan! I have converted my guy to stuffed squash and never thought I could :) so there is hope Liz! It's funny that the smoke alarm came from the stove top and not the oven. You are so impressive - always, Bobbi. I love knowing that zuchinni stuffed with yummies can withstand the oven. (I am a huge zucchini fan so it's nice to add to the repertoire.) Thank you!!! You are so kind Kim :) I hope you give it a try. I actually prefer this to stuffed peppers now. These are so cute, I just love them!! Thanks Shaina :) Since these zucchini were soooo big they were actually about the size of a stuffed pepper!! What a fun idea! These would make such pretty appetizer bites! OH yes, with a regular sized zucchini they really would be. Excellent use of giant zucchini. A friend gave me some a couple of years ago and I never thought to do something like this. Brilliant! And there is sausage in there too. Double bonus. Thanks Renee. Kevin said it was a whole meal in one, meat, rice, veggie WINNER!! Oh my gosh, this is just wonderful. I would love to make this for a party! !